Shape classification is a challenging image processing problem because shapes can occur in any position, at any orientation, and at any scale in an image. Shapes can also be obscured by gaps in their boundaries, occlusions, and noise. General shape classifiers often suffer from low precision, and specialized shape classifiers rely on specific features, like vertices or connected boundaries, making them difficult to generalize. The objective of this research is to design, implement, and test a general, high-precision two-dimensional shape classifier that is invariant to translation, scale, and rotation, as well as robust to gaps in the shape boundary, occlusions, and noise. 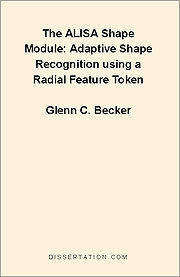 To achieve this objective, the radial feature token (RFT) is implemented as the ALISA Shape Module, which learns to classify shapes in ALISA geometry maps derived from a supervised set of training images. These learned shapes are stored as a set of vectors that are then used to classify shapes in test images. Experiments have demonstrated that this method can learn to classify general shapes from small training sets, as well as effectively classify similar shapes independent of their position, scale, and orientation. The Shape Module is also robust to gaps in shape boundaries, occlusions, and noise. The Shape Module is also shown to outperform some established shape recognition techniques, such as the Generalized Hough Transform.